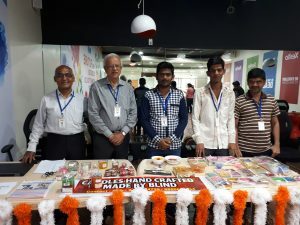 Sunrise candles, Mahableshwar and Niwant Andh Mukta Vikasalay, Pune participated in this event and put up a beautiful display of candles and chocolates, made by visually impaired persons. While Sunrise candles employs over 80 visually challenged people in their factory at Mahableshwar, the department of Choco-Niwant at the organization works as a skill development centre and part time earning for students who come for coaching classes to Niwant. An elaborate and exquisite collection of candles was available including floating, scented, jelly and many different varieties. Chocolates in different flavors and packing was a definite go-to stop for our chocolate lovers. Instead of purchasing these items commercially or imported from stores or malls, this was a chance to make a difference in the lives of these individuals. Both days witnessed a rush of employees who wanted to make the most of this opportunity. The icing on the cake was the enthusiasm of the Xento volunteers, who helped promote the sale of these products, to achieve an astounding collection of Rs. 97,000 in total, in 2 days! Three cheers to our Xentians who truly exhibited the spirit of giving and lived the Xento value Be excellent to each other.